A leading South African university says it will make Zulu language classes compulsory for all first-year students from next year. The decision by the University of KwaZulu-Natal is aimed at promoting "nation-building and bringing diverse languages together", an official said. Zulu is among the most widely spoken of South Africa's 11 official languages. It is the mother tongue for about 23% of the population and is also used as a lingua franca by many others. However, few people from minority racial groups speak it. This is the first time a South African university has made it compulsory for students to learn an indigenous African language, the local Mercury newspaper reports. University of KwaZulu-Natal Deputy Vice-Chancellor Renuka Vithal told the BBC the decision would help students obtain a vital communication skill for their professional and personal lives. "You can come through the schooling system without learning any of the indigenous African languages," she said. "It is surprising that this is still the case, nearly 20 years after apartheid [racially-enforced segregation] ended." The university is located in South Africa's KwaZulu-Natal province, where Zulu is the mother tongue of most people. Until white minority rule ended in 1994, English and Afrikaans, based on Dutch, were South Africa's only official languages. The African National Congress (ANC) government - which took power after apartheid ended - has done little to promote indigenous languages, critics say. Zulu is spoken by more than 80% of people in KwaZulu-Natal, AFP news agency reports. 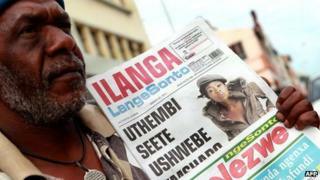 It is the only African language in which a major daily newspaper is produced. Related languages are also spoken in some neighbouring countries.